There are not many artists whose work I try to have more or less complete in my collection. Jim Thirwell is one of them. He operates under several names: Foetus, Wiseblood, Clint Ruin, Steroid Maximus, etcetera. But I don’t want to talk about him in today’s Soundtrack. I wanted to talk about a demo cassette, that I got in a box of tapes from Godknowswhere. The label is very ugly and says Hi HO Silver . The address is of the management in Maassluis. I checked if I could find the band on the Internet, and there is indeed a Hi Ho Silver in Maassluis, but that’s the name of a booking agency for all kind of acts. It seems too much coincidence to be coincidence; I guess one of the band members started this booking agency? I sent a mail, but I got no reply. There are 10 tracks on the tape and I like them quite a bit. (Every time I use words like quite , great , favourite and a handful of others, I realise that my English vocabulary is very limited. It would be much easier for me to write in Dutch, but I am afraid that half of the readers of this Soundtrack can’t read Dutch.) 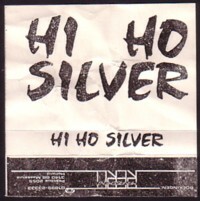 The music of Hi Ho Silver reminds me of the early records of Foetus. Well, sort of. Here is one track that I like in particular. ( In particular , that’s another example of my limited vocabulary.) There are no songtitles on the label, but I named it Take it off. Wow, it melts my face. Thanks. Never heard a similar bigband sound, as if it’s heavily dubbed. So are the other tracks on the tape anything like this? they ceased to exist somewhere around 1995. they were quite a good pop band with an ecclectic repertoire. Do you have those LP’s, Lukas? I am curious what is on them.